When I first opened the PUMP package, I paired them with my Nexus 5 and started listening. I never charged them up or checked to see if they came pre-charged. They did. In fact, I listened to them for over five hours on that initial charge and was pretty impressed with how long they lasted. As they neared the end of their charge, a tone would sound every few minutes until they disconnected and were dead. Battery life is the biggest drawback of any wireless device and while the Sportbuds have a nice large size, the battery life is not all that stellar. BlueAnt spins it this way. If you exercise an hour a day, they will last you a week. The truth is, many of us would like to listen to these at other times than when we are exercising. In that case, you may listen to these five or more hours a day and then you'll have to charge them every night so you don't run out of audio during the day. I had hoped for better battery life, but in the end you trade off battery life for audio quality. Thankfully, they do charge fairly quickly and the charge port is under a watertight flap on the bottom of the left unit. As previously mentioned, it takes a standard microUSB cable and charging was done in less than two hours. While standard Bluetooth claims to have a 10M range, the PUMP HD Sportbuds state that you can "Roam untethered with up to 100ft. wireless range". I'm not a mathematician, but that makes the range just over 30M. That is a nice boost - if it works. I used these in a building as well as wide open spaces, and out in the open I was able to get 30M away without any issues at all. In fact it was about 35M when I started to drop the signal. Keep in mind that this is with perfect line of sight, and your individual results will vary. When I tested these, there was no other wireless interference. The range is great and for all practical purposes, you'll be able to leave your phone anywhere in the workout room and still be able to hear your audio crystal clear. The term "audiophile-grade" should not be confused with audiophile quality. While the Sportbuds sound pretty good, they are a little bit bass heavy and the midrange sounds are not as clear as a good set of wired headphones. If you're currently using some cheap $20 wired earbuds, these will likely outperform them hands down, but if you expected them to be a wireless version of a Sennheiser IE 60, you'll be let down a bit. The audio quality is very good and with a proper fit, I was actually very impressed, but if you listen to these side by side with expensive earbuds, you'll be able to quickly tell the difference. Overall, the quality is very acceptable. The only real downside I noticed is that when these are connected to a device, and the music is paused, you will be able to hear a background hiss that does exist throughout the entire listening experience. It is imperceptible when music or other audio is playing, but if there is a break in the song, you'll be able to hear it. The build quality of the PUMP is amazing. I abused these and left them in the sun, dropped them on the road, jammed them in a pocket, stuck them in the dirt and drown them in the pool and the still survived. While the IP67 rating states that these are completely "dust tight" and can be immersed in water 1 meter deep for 30 minutes, most people don't or won't try and put their hardware though this. We tested these out in every aspect and even took them down to depths of 2.5 meters - albeit for only a couple of minutes. The PUMP HD Sportbuds survived with flying colors. The build quality is excellent and the design of the product is very durable as we indicated from our abuse. The overall fit of these will vary depending on how your ears are shaped, but for me, they worked great. The different sizes of tips should work for almost everyone, and if you need a little help, the stabilizers should help keep these jammed in your ear holes. That being said, I've never found stabilizers to be that comfortable and it would be a shame to ruin the comfort of these. I've worn these for hours and they were fantastic the entire time. I never tested with the stabilizers installed but without them, I could wear these all day without any discomfort. The fit and comfort on my head are fantastic. At the end of the day, the BlueAnt PUMP HD Sportbuds are a great product, but they aren't perfect. The audio quality is very good, but if you're expecting true audiophile quality, you'll be a little disappointed. They are some of the best Bluetooth headphones I've used, but they are a little bassy and mushy throughout the mids. Keep in mind that this subjective, and individual tastes vary. The battery life is decent and if you wear these just for working out, you'll probably get through a week with no issues. If you wear these daily for extended periods for listening to your favorite music or even to try out a free audiobook (shameless plug), you'll probably have to charge these every night. For the size of the units, I expected better than eight hours of playback. The controls are simple to use and work very well. Pairing is done with a long press on the "Play" button until the LED flashes. Once that is done, you can find the PUMP in your Bluetooth menu on your phone and you're good to go. A couple of things that are absolutely fantastic about these are comfort and durability. I wore these for hours a day without any issues at all and we abused these pretty hard and even took them deeper than their IP67 rating and have had no issues at all. They take a beating and keep on working. That is probably the most impressive and their best quality. You can't really go wrong with the BlueAnt PUMP HD Sportbuds in my opinion. While they don't stand out in the quality or battery life department, they don't fall behind either. For around $100 you can get a pair of these and leave your phone in your pocket while you work, play, swim, jog, surf, bike and hike or skydive. They stay in place and provide very good audio no matter what you're doing. 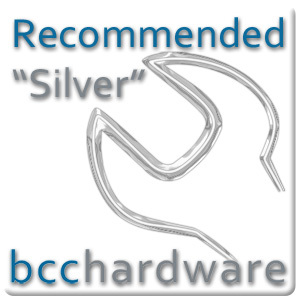 Even though they have a couple of issues, I still give these a "Silver" here at BCCHardware. They score a solid 8/10 in my book. I'd like to thank BlueAnt for sending the PUMP HD Sportbuds our way for review. If you are active and can snag a pair of these, you won't be disappointed. Please feel free to leave a comment, question or general feedback in our forum at the link below.